How about a fun Friday post :)! This cake was ridiculously easy to make but super impressive. Three of my girlfriends all turned another year older within a few weeks of each other, so we had a birthday celebration for them and I offered to make the cake…only because I had been dying for a reason to make this. Many of the people who enjoyed this cake claimed that they would make it for their next party (and hey, so did the rest of Pinterest too!). This recipe says make an 8″ cake – but I didn’t have that size pan. So, I went smaller (mine was about 5-6″) and I used the rest of the cake mixture to make mini-cupcakes, which accompanied the cake! When cooled, use your favourite chocolate icing and ice the entire cake evenly (be generous with the icing). 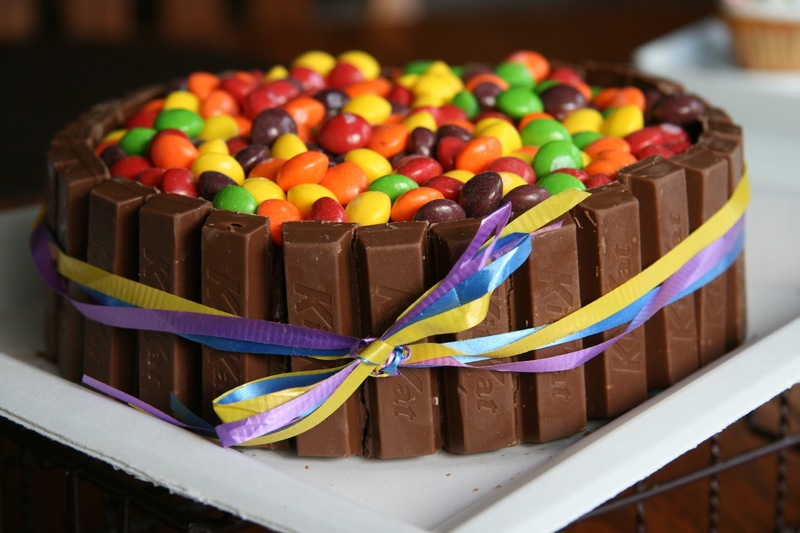 Break the Kitkats into singles and gently place them around the cake, as shown, until covered. 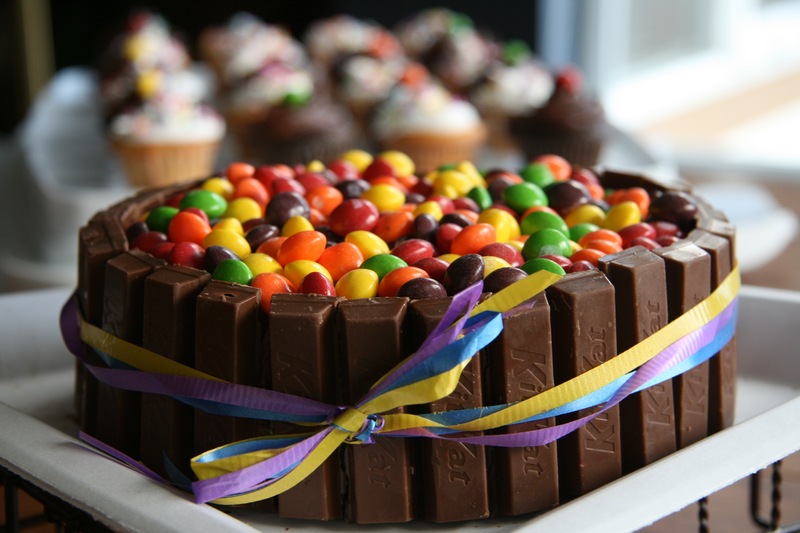 Place your favourite candy on-top, tie with ribbon and you are done! One thing to note – it is best to place this on the serving dish/cake carrier or whatever you plan to use BEFORE you ice the cake – just so you don’t have any mishaps later! Now go enjoy being 5 while eating this cake – or I hope the true 5 year old enjoys this cake. Breakfast has long been a favourite meal of mine, as long as it involves a lazy morning, coffee and a savoury meal. I am not one for pancakes, waffles or anything sweet – but put a plate of eggs, hash browns and bacon on the table and I am happy. My girlfriend had us over for brunch a while back and when we were arrived, we were greeted by the smells of an amazing strata. 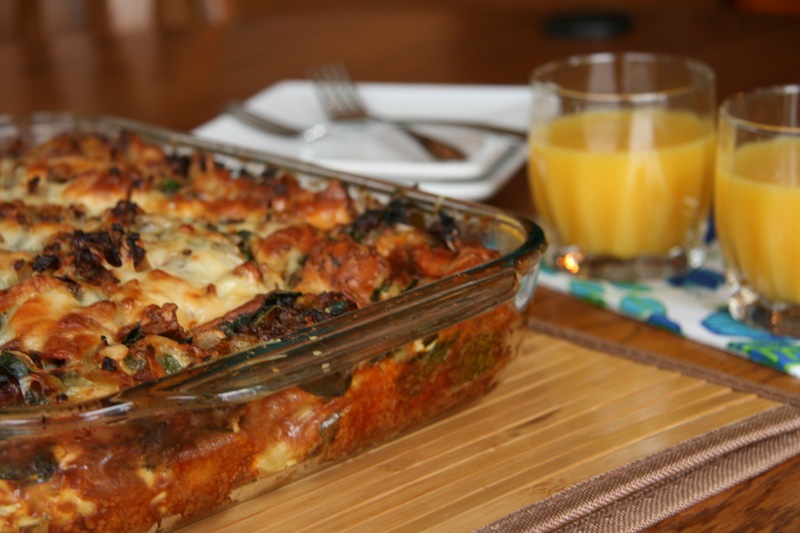 When we sat down to eat, it was warm, comforting and delicious and reminded me how good a strata could be. I love that strata’s are a little work to prepare ahead of time, but they are perfect for company and gatherings, as they are fairly hands-off once in the oven. They also reheat beautifully, so it would be a great option for those quick weekday breakfasts too, if you are organized enough on a Sunday to prep it. One of my friends in Vancouver recently had a sweet baby girl and although we cooked up a storm before her arrival and stocked her freezer, I still loved bringing her meals every time I visited, just to make her life a little easier. She loves all things breakfast (sweet things too – which you will see in a future post! 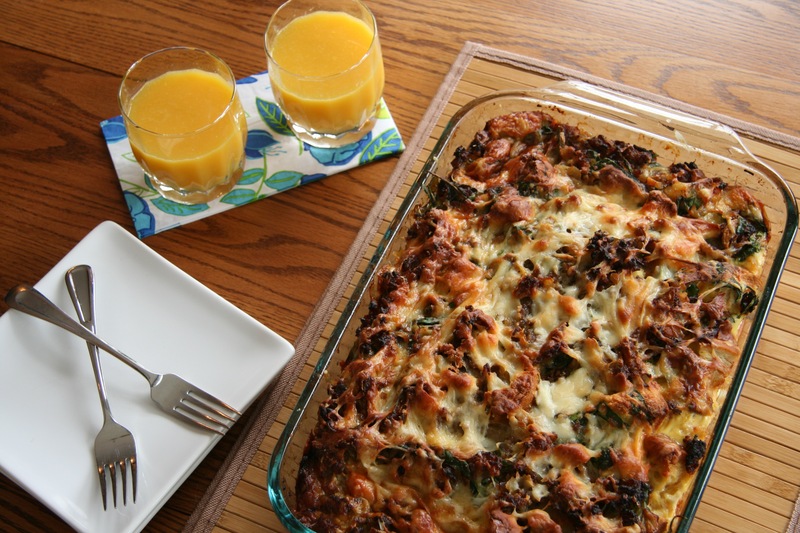 ), so I combined a few recipes and brought this strata one Saturday morning when my Mom and I visited her. It definitely won the praises of all who enjoyed it. It is hearty, savoury and just perfect for a weekend brunch, and if you are lucky, leftovers for the week. If you are looking for a crowd-pleasing, impressive brunch item, this is it. You can also spoil those you love and make it for a weekday breakfast, but be careful as it will be requested, again and again. Cook the breakfast sausage according to the package directions. Once cooked through, drain the fat and set-aside the sausage in a bowl. Once you have drained the fat from the sausage and removed it from the pan, add the onion to the pan and sauté for a few minutes, till the onion is soft and translucent. Add the onion to your cooked sausage, and then add 1/2 teaspoon salt, 1 teaspoon pepper, and nutmeg. Stir. Add in the fresh spinach. Butter a 9×13 baking dish. Spread one third of bread cubes into the bottom of the baking dish and top evenly with one third of sausage and spinach mixture. Sprinkle with one third of each cheese. Repeat layering twice (ending with cheeses). In a medium bowl, whisk together the milk, eggs, mustard, and remaining 1/2 teaspoon salt and 1/4 teaspoon pepper. Once nice and frothy, pour the egg mixture over the bread mixture. Do not stir or worry about it looking uneven, it’ll be fine once it has time to set in the fridge. Cover your strata with plastic wrap or tinfoil, place in fridge and let sit for at least 8 hours (for bread to absorb egg mixture). This is best to do the night before and then the work is done for the morning. Remove the strata from the fridge about 30 minutes before baking, to allow it to come to room temperature. Bake strata, uncovered, in middle of oven until puffed, golden brown, and cooked through, 45 to 55 minutes. Serve with a nice simple green salad, fresh fruit or all by itself. It has been a while since this blog of mine has been updated, and while being back to blogging feels great, it comes with trepidation. It has been a while since I picked-up my camera and a while since it felt right. It has been a tumultuous past 10+ months in my life. There have been some highs and the absolute lowest of lows. But I am not here to re-live the past, I am here to enjoy the present and share with you some happiness on a plate and to remember the good memories that come along with cooking, baking and sharing food with those closest to me. 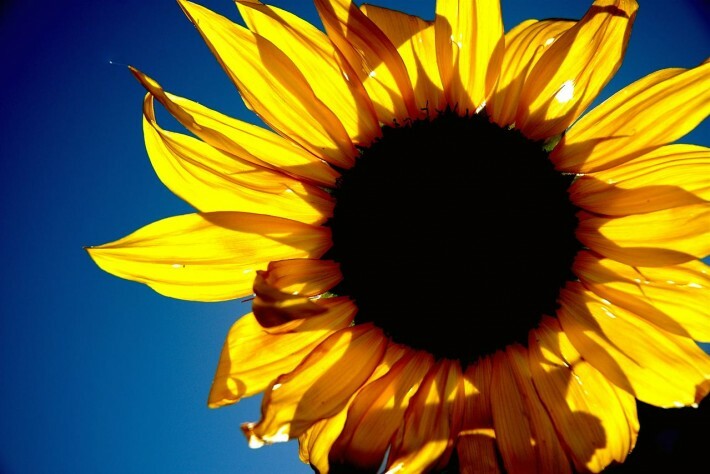 Thank you for sticking with me for those who are still around, and if you are new, thanks for reading – I hope you will love the recipes!